Cemetery Heritage in Quebec: A Handbook. This book, written by Matthew Farfan and published by QAHN in 2008, is available in soft-cover format. The illustrated, 52-page handbook features a wealth of information on cemetery law in Quebec, cemetery associations, registered charities, fundraising, municipal citation of heritage sites, cemetery maintenance, gravestone repair, recruiting volunteers, and more. 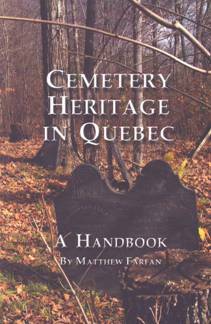 To order a copy of Cemetery Heritage in Quebec: A Handbook, send cheque or money order for $15.00 (including shipping and handling to anywhere in Canada) to QAHN, 400-257 Queen, Sherbrooke (Lennoxville), Quebec, Canada J1M 1K7. For more information, contact QAHN at (819) 564-9595 or at: home@qahn.org.